It’s that time of year again when I start getting the itch… the spring cleaning itch. My husband and I have spent the last few days cleaning our house from top to bottom. I try to stay up on my housework with my house cleaning schedule, (and my kids keep up on their chores) but every once in a while, a deep cleaning is in order. So I’ve been cleaning inside, and my husband has been taking care of the garage and the yard. 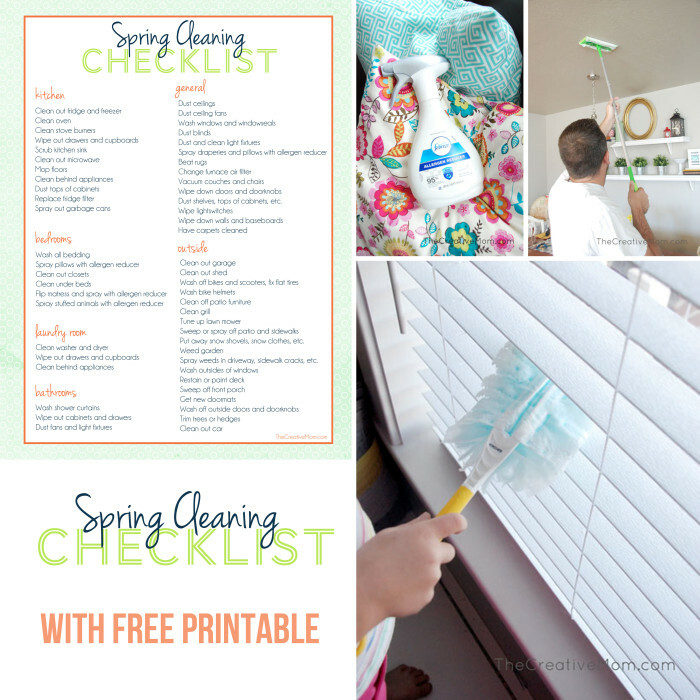 Just to make sure we didn’t miss anything, I created a spring cleaning checklist. And I’m excited to share it with you today, along with a few tips for keeping your home dust and allergen free. According to the Asthma and Allergy Foundation of America (AAFA), when it comes to spring cleaning, many people may actually be doing it wrong, stirring up the very allergens they are trying to remove from their homes. I am happy to team up with Fabreze and Swiffer on to share some products and tips that are certified asthma and allergy friendly. First, start at the top and work your way down. 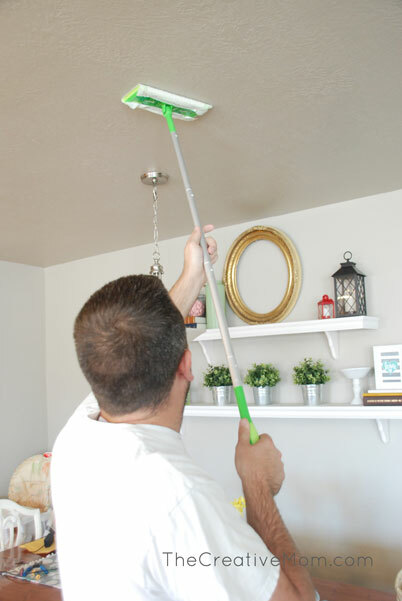 I (ok, my husband) used my Swiffer Sweeper to sweep all the dust off the ceiling, then we did the walls, and tops of the cabinets, before we moved on to the windows. 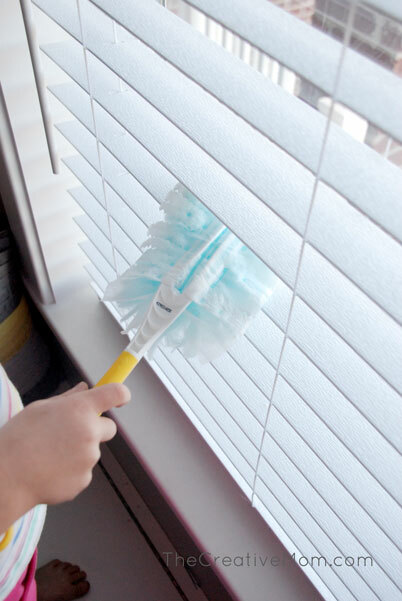 Since we’ve lived in our house (for 3 years), I’ve never cleaned my blinds… I know. Someone please tell me I’m not the only one. It’s not that they don’t need a good cleaning- trust me, they do. But I just haven’t known how to clean them without spreading the dust EVERYWHERE. My mom used to take her blinds down and spray them off in the bathtub or with the garden hose on the front lawn, but that wasn’t going to work with my wooden blinds. So I was excited to find that Swiffer Dusters not only get the dust off my blinds and ceiling fans, but they don’t spread the dust everywhere else. 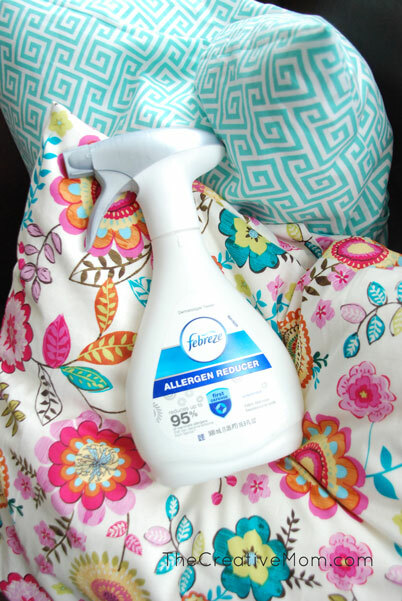 One of the last things I did was spray all my upholstery, pillows, and curtains with Febreze Allergen Reducer spray. I can’t throw all of my fabrics into the washer, so it’s nice to know they’re clean and allergen free. I’m excited to be able to help one of my readers get a headstart on Spring Cleaning with a Swiffer/Febreze allergen prize pack, featuring: 1 Swiffer Dry Sweeper, 1 Swiffer Duster and 360 Duster, Unscented, and 1 Febreze Fabric Refresher Allergen Reducer.